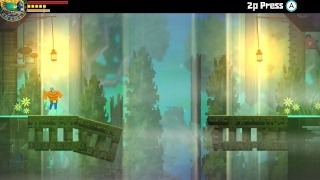 Gaucamelee is a Metroidvania style platformer with beat em' up elements and was developed by Drinkbox Games. 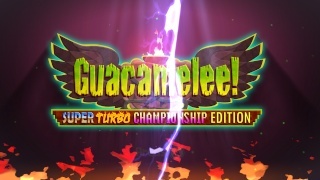 The game has alot of potential and is critically acclaimed on other consoles so what did we think of this upgraded Super Turbo Championship Edition for the Wii U eshop? Keep reading to find out! 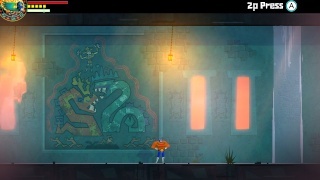 Guacamelee: STCE emphasises on tricky platforming and beat em' up battles and can be quite challenging at times. The platforming will require the use of many powers you'll obtain over the course of the game by destroying special statues that will allow you to learn new skills such as the Rooster Uppercut in order to reach previously inaccessible areas! It becomes especially challenging later in the game where you'll need to use many skills in succession in order to bypass a single obstacle. The battles in the game are fast-paced and require button mashing early on, however later enemies will be shielded and will require you to use specific skills to break the shield. All in all the gameplay is very fun, but extremely challenging at times! The boss battles can also prove to be quite challenging and in most cases are cameo's of classic video game titles. The first true boss battle for instance will remind users of the original Super Mario Bros. title for the NES! The cameos don't end at boss fights either as wall murals, billboards, and even characters in the game are heavily inspired by classic games! The game is quite lengthy and has many different bosses and unique zones on the map, first time players will likely take 12-15 hours to beat the game, but then there are many sidequests such as the challenge dungeon, town requests, and optional back-tracking to obtain every item in the game that will likely increase the time to complete the game to at least 20 hours! The graphics in Guacamelee: Super Turbo Championship Edition are impressive as it has the same level of HD gloss as retail Wii U titles such as New Super Mario Bros. U! The characters look impressive, but it's the background scenery that is really breathtaking and detailed. The dimension shift ability that allows you to travel to the world of the dead allows you to see a completely different version of the world in a similar manner to what is seen in Giana Sisters: Twisted Dreams and it looks equally as impressive! The music in the game sounds like authentic Mexican music which is very fitting for this game and some of the tracks are extremely good! The sound effects in the game are also quite impressive, but sometimes the SFX is too loud on the default settings so you might want to change them in the options to avoid blowing out your speakers on your Gamepad! The controls in the game are responsive and are only moderately difficult to learn, however the option to use the Classic Controller Pro would have been nice for this game, but regardless the controls aren't too difficult on the Gamepad. The Off-TV play is a nice feature as well, but make sure to adjust the volume accordingly to prevent damage to the speakers on the Gamepad! 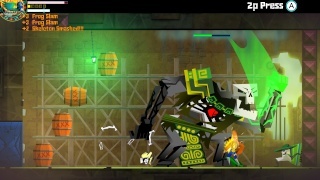 With challenging, yet highly enjoyable gameplay, superb graphics, and a terrific authentic Mexican soundtrack Guacamelee: Super Turbo Championship Edition is an excellent addition to any Wii U library of games, however somewhat difficult controls and the lack of Classic Controller Pro support are somewhat disappointing, however we still highly recommend this superb Wii U eshop title! Just another game to add to my wish list! I really need to start finishing games before I start a new one or get a new one. Time hasn't been on my side lately. At the very least this will go at the top of my wish list as it seems to be a good Metroid clone! Nice review! At least we're not dealing with a games drought anymore. Your review is awesome too! @Tech101 wrote: Just another game to add to my wish list! I really need to start finishing games before I start a new one or get a new one. Time hasn't been on my side lately. At the very least this will go at the top of my wish list as it seems to be a good Metroid clone! Nice review! I think that the controls could be better, but otherwise it's a really good game. I'm considering downloading this title, but I'm not entirely sure that I would enjoy it.